You will find that our Treasure Garden Market Wood 9' Octagon Patio Umbrella offers all the traditional features of a high quality market umbrella with a few extra luxury features that make it simply irresistible. The pole for this umbrella is made of eco-friendly FSC certified hardwoods and has a gorgeous upscale look. The lift system uses a four pulley system which lifts the canopy with ease. With its wide selection of premium fabrics by Sunbrella and OBravia you can surely bring a fresh perspective to your open-air space. Offering your guests shade from the harsh sun this season will be a breeze. 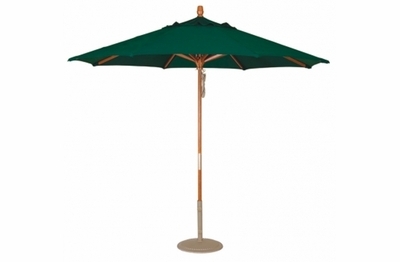 Add the Treasure Garden Octagon 9' Wood Umbrella to add both sophistication and style to your outdoor environment. * Weight: SWV: 26.4 lbs. DWV: 27.4 lbs. * Coverage: 64' sq. ft.